11x17 Print. Pen & Ink. Lots of Photoshop. Is this available to buy anywhere? I love it!!!!! Hey, sorry, accidentally used this image on one of my Atari cartridge icons but have since pulled it when someone told me the actual source. You should be honored because I came across this in an archive of pulp novel photographs, so convincing was your work! Anyway, it was popular, so I will repost with full credit to you if you give me the go-ahead. If not, no problem, have several other Batman Arkham Asylum entries. I am in awe of your great weathering details. Hey- go head. Any credit is appreciated. Thanks. Great, thank you, I will repost with full-credit to you and a link to your DA page of the piece. Omg i need this in poster form! And here I was expecting a Harliquinn romance novel. Great concept and wonderful execution right down to the used book cover feel. Bought this today at Beachball comics actually in Orange county. Framed and already in my office I love your work!!! I want the New Hope one I am a huge star wars freak but they didnt have it there. love this so much...great art and multiple layers of meaning make it even awesomer. Beautiful! I love how Joker almost looks like a cut-out. The aged edges are a nice touch as well. 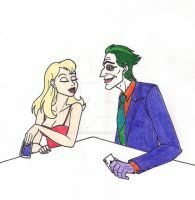 What does she see in the joker?